Making the decision to downsize your current home and move to a retirement community is one that can take time for careful thought and deep contemplation. However, once you’ve realized all the benefits downsizing offers to fully enjoy your retirement years, you’re on your way to enjoying the active, maintenance-free lifestyle a senior living community provides. However, before you sign on any dotted lines and start packing up your home, it’s important to feel confident that you’re choosing the best community for your future. Question #1: What is the average age of current residents in the community, and how many residents are there? When choosing your future home, keep in mind that the current residents will become your new neighbors. 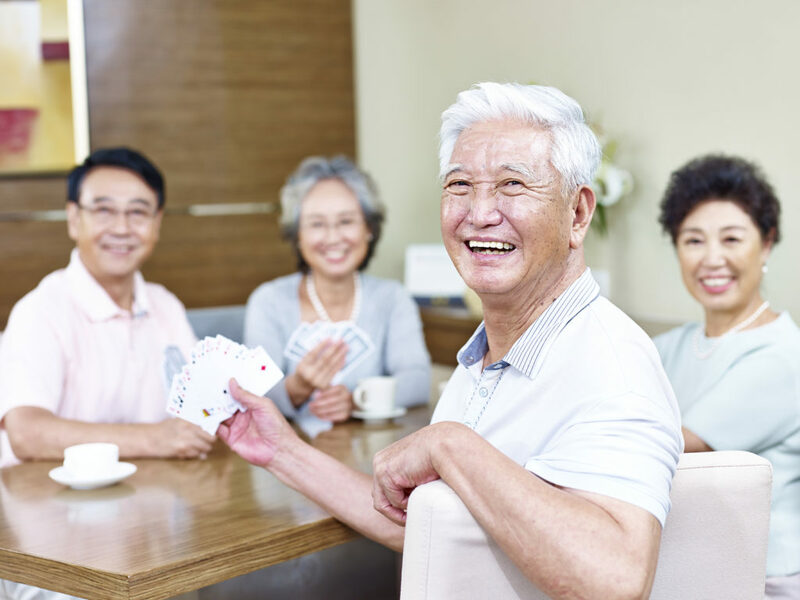 And, because building and maintaining relationships into your later years is such an important element of healthy aging, you’ll want to be sure you’ll enjoy spending time with and find some common ground with the current residents. Additionally, consider the size of the retirement community. Are you looking for a small, close-knit community with walkable options for dining and activities? Or, would you prefer a sizable community where you get to meet new people on a regular basis? Question #2: What type of floor plans are available? When you’re coming from a long-time home, it’s possible one of the reasons you chose to downsize to a senior living community is due to the fact that the home had become too large; there were rooms you no longer used, too many stairs to navigate, or too much upkeep involved. While your living space may be somewhat smaller, retirement communities still offer a variety of floor plans and housing options with everything from spacious villas to comfortable apartments. Think about the type of home that would best meet your needs and ask to tour a model within the community to get a true feel for the space. Question #3: Are there opportunities for life enrichment? Most older adults these days seek activities far beyond bingo, and if you’re one of them, make sure to ask about what kind of engaging opportunities the community offers for physical, social, emotional and mental wellness. Ask if you can view a sample calendar of lifestyle events or even if you can participate in one before you make the decision to move to the community. Question #4: How many levels of care are provided, and at what cost? Should your health needs change in the future, it’s important to have peace of mind that the retirement community can accommodate them by offering supportive services like assisted living, skilled nursing and rehabilitation or memory care. You should also ask if these services are included in your continuing care contract or if there will be an additional cost for a higher level of care. Question #5: What services and amenities are offered as part of your monthly fee? Some retirement communities may charge a flat monthly rate for a variety of onsite services and amenities, like transportation, dining options, home maintenance, housekeeping, and even utilities, Other communities might offer these services on an a la carte basis. Plus, many communities offer onsite amenities like hair salons or fitness centers, so find out if these options are available and at what cost to residents, if any. It’s important to consider which services and amenities are most important to you, too, and which you can live without. Find enriching senior living near you in Kalispell at Immanuel Lutheran Communities, where you’ll enjoy everything you need for socializing, learning, relaxing and growing. Learn more about our vibrant living options and health services by contacting us today.